When Moving sometimes it is necessary to store your mattress. If your items are going to be stored short term then you don’t really need to overthink how your items are stored. However if you are storing for a long period of time, how your items are stored makes all the difference in the world! How to Store Your Mattress and Box Springs. To protect your items first think about the type of storage you need to rent. Most storage buildings are not climate controlled which should be fine for most of your items. If you have artwork, antiques, expensive mattress set it’s worth the comparing the price of the climate controlled units. It is best to put your mattress in a mattress bag or mattress box or both. You can find these at your local moving supply store, your mover can bring it if you ask, or call your local mattress store they may have some. The key here is to make sure the bag is sealed. Mattress bags usually run about $3-$15, definitely worth the price of your nice comfy mattress, right? And it will keep any pesky bugs out. Do you store your mattress on it’s side or flat? It is more convenient space wise to store the mattress on it’s side. 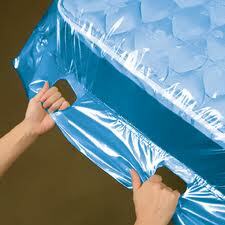 It is better for your mattress to store it flat, however a good quality mattress should hold up fine on it’s side. You have layers of material that are glued down in your mattress and storing it flat ensures that when you come back for your comfy friend everything is still where it should be without any weird lumps. If you are moving locally it is not really necessary to get a mattress bag if you hire good quality movers. A good mover will put a moving pad down on the floor of the truck to put your mattress on. You mattress or box springs should never touch the ground or the any other surface, don’t be afraid to ask your movers to put it on a blanket. Hope this help to answer some questions. Have any tips to pass on? We’d love to hear your ideas.